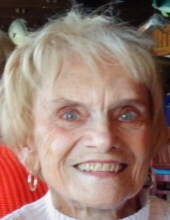 Lois Ann Nelson Gilman, age 85, formerly of Shalimar, passed away at Mayflower Community Health Center, Grinnell, IA, on Friday, Nov. 23, 2018. She was born July 1, 1933 to Lester A. Nelson and Pearl Linquist Nelson at Red Oak, IA. Growing up, she was active in school, athletics, and 4-H. Lois was baptized, confirmed, and married at the Fremont Lutheran Church at Nyman, where she will be laid to rest. A graduate of the Iowa Teachers’ College, Lois spent her career as an elementary teacher in Ft. Madison, IA. A well-loved and admired teacher, Lois had a particular interest in natural science. She greatly enjoyed birding, kayaking, and cycling. Lois continued her dedication to education in her retirement as a volunteer at area nature centers and as a regular volunteer at the Shalimar Library. Lois was a lifelong learner and avid reader. She loved to travel and learn about other places, people, and cultures across the country and around the world. Family ties were very important to Lois and after her retirement in 1990, she moved to Shalimar to be near her sister and her family. She moved back home to family in Iowa in April 2018 to the Mayflower Community in Grinnell. Lois was a member of St. John’s Lutheran Church, Niceville; P.E.O. Chapter GP; and several organizations such as the National Audubon Society, Sierra Club and The Nature Conservancy. She was preceded in death by her parents, her sister Nadine Nelson Liljedahl, brother-in-law Weymer “Mac” Liljedahl, and sister-in-law Patricia Nelson. Lois is survived by her brother Norman Nelson and his wife Joanne of Red Oak, IA, and Lester Allen Nelson also of Red Oak. Nieces and nephews, Beth Catalano, Marcia Penney, Steven Nelson, Mark Nelson, Laura Nelson Lof, Chris Nelson, and Julia Nelson Elgar, as well as several great nieces, nephews, and a host of dear friends who all loved her. Services will be held at a later date. Memorials are suggested to the Shalimar Library. To send flowers or a remembrance gift to the family of Lois Ann Gilman, please visit our Tribute Store. "Email Address" would like to share the life celebration of Lois Ann Gilman. Click on the "link" to go to share a favorite memory or leave a condolence message for the family.